Learn how to practice a kick tip, also called the toe tip or toe tap. 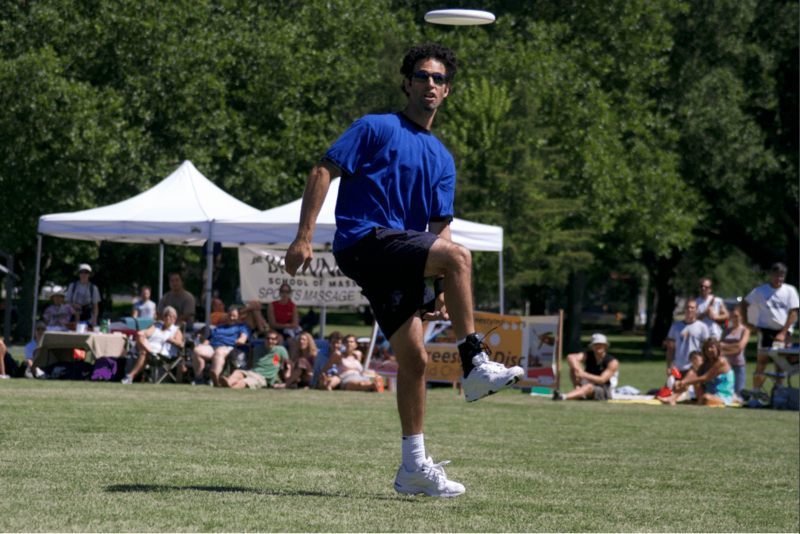 The goal is simple, kick the disc with your toe to pop it back up into the air. Kick tips are great for a couple reasons. 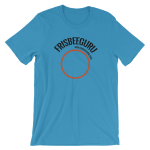 First, it is a gateway trick to begin integrating feet into Freestyle Frisbee. Second, kick tips a great way to save a disc that can’t be reached with the hand. To practice, set the disc flat in front of you just under leg’s length. This can be done with a self set throw, or from a center delay. Now, point your tow towards the sky and kick the center of the disc with medium power. The goal is to lift it back up to chest height to regain control. To improve your kick tip, watch the disc intently. You want to aim your toe to hit the center. To judge how close you came to the center, watch the wobble of the disc. If there is no wobble, you hit the center correctly. The more wobble there is, the further from the center you contacted. As you watch, you’ll get the feel for how to hit the center every time. Have a kick tip story? Let us know in the comments below. Tipping a disc is when you poke the disc with the tip of your finger to pop it back up into the air to keep it in flight. Often, this is one of the first tricks someone will learn after the basic throw and catch. One subtle difference, however, is that many people begin by tipping the disc while it is above their head with their palm facing down or out. Here Ryan shows a more advanced version with the palm up and the disc directly in front of you. Basically, give yourself a flat throw with lots of spin. Then curl under your pointer finger, hold it with your thumb, and point the remaining finger upwards, with the palm up. Then, tip the disc in the center, over and over. Not too hard, just enough to keep it under control and in front of you. This is a handy skill that can be placed anywhere in a series of tricks. For example, set the disc under your leg, then tip it. Also, this tip can be made more advanced by adding a restriction. Tip it under your leg, behind your back, or in a bad attitude position. If you want to see how far tipping can go, check out this video of Joey Hudoklin. Might be the most hein tipping combo ever. Question: What is tipping? Answer: Striking the bottom of the spinning disc with your fingers causing the disc to bounce upward. You can also do an elbow tip, a head tip, a toe tap, heel tip or a knee tip. Today I’ll only be covering tipping using fingers. When you first start to learn to tip, start tipping above your head. Begin with the two handed self set. Rev the disc up with as much spin as you can generate so the disc lifts up above your head. Look up at the disc and find the center of the disc and as it comes down, give the disc a good pop with the end of your middle finger and ring finger. Hit the disc with the pad of the finger tips. Keep the two fingers nestled together and slightly bent for stability. First try one tip then catch the disc. Then try two tips. Now three. Now go pick the disc up off the ground….OK, now try tipping off of someone’s throw. If the disc comes in high and if lofting on a nice throw try one or two tips then catch the disc. Now go pick the disc up off the ground. If you want to learn a new trick you better get used to doing that. If you can do a nail delay and you have mastered “the above your head” tip you’re ready to learn the underhand tip at belly level with the palm up. This is more difficult. To find the right spot to tip, clap your hands together at belly level like you were applauding an amazing combo that Tom Leitner did. The spot where your hands meet is the spot where the majority of your tipping should take place regardless of which hand you use. Get the disc on a nail delay with your palm up at the same spot I just suggested that you should tip the disc. Loft the disc up to chest level and as the disc comes back down, with your middle finger and ring finger nestled together and with your palm up, strike the disc with the pad of your finger tips. (not the nail side). Bend or curl your fingers a little bit to create more stability when tipping around belly level. Don’t tip with your fingers straight. I would suggest tipping with alternating hands. One tip with the right, one with the left, one with the right, etc., see if you can keep it going until spin runs out. The more spin on the disc, the easier and more stable the tips will be. Fake nails don’t work well for tips. That’s why I only use a fake nail on my index finger and reserve the middle finger and ring fingers for tipping. Restricted Tips: Before you try these. Did you stretch??? Always stretch lightly before and after you play… Restricted tips are done under or around the leg or behind the back, and even be behind the brain. The most advanced tipping and the coolest tipping combos use only restricted tips. It takes practice. Right hand under left leg. Right hand under right leg from the outside. Now reverse everything above using the left hand. Left hand behind the back. Bad attitude tip (tip done in bad attitude position) both left & right hand. Right hand in inverted position, tipping under right leg. Left hand in inverted position, tipping under left leg. Always strike the center of the disc. Try to tip at belly level, and try to stay under the disc (I mean have your hand under the disc). There will be a sweet spot that you will find for each of the different restricted tips. Learn the sweet spot. It should be about where you clap your hands at belly level. Try some nail delay combos and throw a tip in here or there to get better at it. Then maybe throw in two or three consecutive restricted tips in a combo, . Advanced Tipping: The most important tip is the first tip of a combo. If the tip ends up with the disc coming back down at an angle then it’s difficult to follow it up with more consecutive restricted tips without having to get the disc back on a nail delay or to do a “the” tip. A “the” tip is the basic non-restricted tip done at stomach level without the tip being done from under a leg or behind the back. So…make sure you set the disc up flat and high to start the first tip in your tipping combo. And of course, always aim at tipping the center of the disc. Having some high tips mixed with lower or medium height tips make the combo have more variety and actually can make it easier to execute. I don’t know why, but I’ve noticed that it seems to help. Having a high tip every third tip or so helps buy you time to get under the disc for the next tip. Move with the disc. If you tipped the disc too far to the left or right, or too far in front of you, move with the disc. Make your feet, not your arms, do the work to get you to the right position for the next tip. You can’t be flat footed during a tipping combo. Tipping injuries: If you do too many high tips you can hurt your fingers. The disc can compress the joints a bit. So to avoid this problem I try to limit myself to only a few tipping combos every time I play. You could also use a smaller and lighter disc to practice tipping to limit this problem. Overdoing any one type of move or motion in one practice session can lead to injury.